In 1904 it was agreed that from the scenic point of view the new camp was in beautiful country, but after 14 days of regarding the view boredom set in. 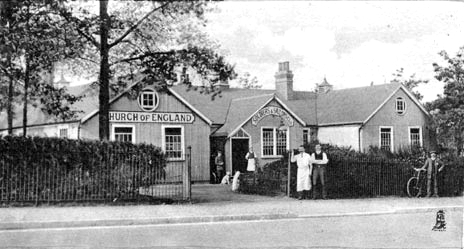 An Institute was therefore built (where One Stop shop is situated now) at a cost of 1,500 Pounds (from a grant of 1,000 Pounds from the Church of England Soldiers and Sailors Institute Association) and a further 1,000 Pounds until it was self-supporting. It was to be open to all soldiers and sailors wearing the King's uniform regardless of religion. The building was opened in August 1904 by Princess Alexander of Teck, who, with the Prince, had motored from Aldershot. She arrived at 3.45pm, was shown over the building and presented with a bouquet. Afterwards tea was provided for the visitors. The Institute was of corrugated iron, boarded all round inside and put up in 7 weeks. There was a refreshment room, a reading and writing room where concerts could be held, a billiard room, a large devotional room with a harmonium and 5 bedrooms with 2 bathrooms. In September 1906 a large new hall was added to the back of the Institute. It seated 500 and was used for services and entertainments. The entertainments platform was at one end and at the other, shut off by shutters, was the Chancel, only opened during services. In 1908 the Brownlow Hall was added and named after Major General Brownlow, who was president of the C. of E. Institutes. This was used for dances and many other activities including a cinema, until one opened at the Empire Club in 1938. During the Second World War the two world billiard champions, Joe Davis and Sidney Lee, frequently came down to give exhibitions and to play billiards with the Canadian troops. The building was closed in 1960 and demolished. The site is now ocupied by Pinewood vilage hall and a One Stop Convenience store.